Few things can warm you to the core like a good, hot bowl of soup in the dead of winter. With Michigan's in full effect, there isn’t a better time to enjoy the cold weather favorite by the cup or by the bowl, cream-based or clear broth. 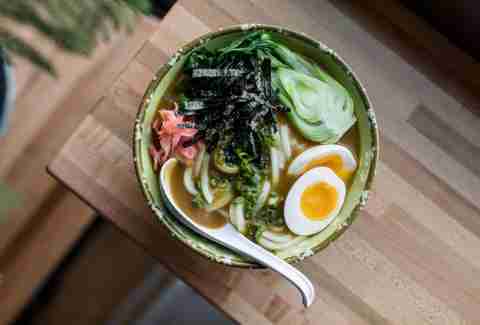 Whatever it is you're in the mood for, even the deepest chill can be fended off by soups, stews, bisques, ramen, and pho from around the D. The city is rife with places ladling out the good stuff. Stay warm with a bowl of piping hot soup at one of these 10 Detroit spots. 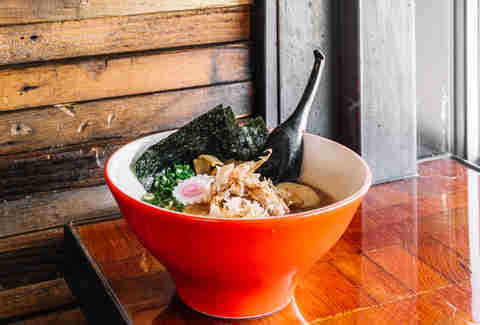 Only recently opened (and before that, highly hyped), this chef-driven Corktown spot has already begun to impress the palates of critics and diners alike with its steaming bowls of udon noodle soup. Though most the menu is perfectly carnivorous, vegans and vegetarians rejoice: You have options! The Forest udon, made with porcini broth, sesame tofu, smoked trumpet mushrooms, rosemary, and garlic oil, is as fragrant as it is delicious. Pair it with a hot genmaicha -- green tea combined with roasted brown rice -- for the ultimate chilly weather meal. With multiple locations throughout metro Detroit, Pho Lucky is the local authority when it comes to the popular Vietnamese noodle soup. Made with beef broth, thinly sliced eye round steak, cooked beef, meatballs, tendon, and beef tripe, and served with Asian basil and cilantro for tearing, lime wedges for squeezing, and bean sprouts for mixing in the rich, clear broth, it is the ultimate bowl of comfort food. Feeling adventurous (and seriously hungry)? Try the pho challenge and take on a 5lb bowl of soup for a free T-shirt and meal. You only have an hour -- get to slurping. 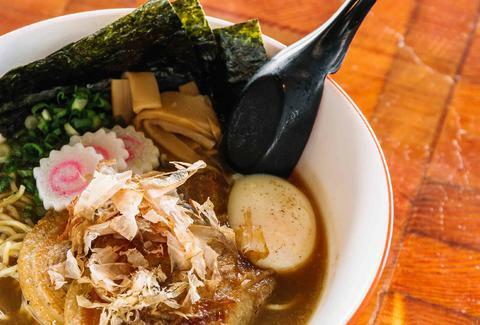 This Detroit-inspired ramen shop features bowls you won’t find anywhere else. While the menu is decidedly of a Japanese inclination, selections like the Southwest, made with the Noodle King's signature both, shredded chicken, scallions, corn, tomato, cilantro, housemade créma, a fried wonton, and topped with shredded cheese, is a hybrid soup that's purely Detroit. If you’re low on dough, check out the Dorm Room ramen. For less than $10, you’ll get a massive bowl of simple noodles and broth. Brain food! Every meal at this Southwest Detroit steakhouse is accompanied by a side order of soup -- but don’t let that fool you. The sopa here is no side player. 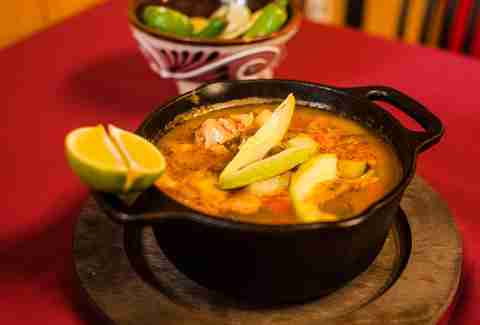 The location touts regularly changing soups of the day alongside staples like the consomé de pollo, made with tender shredded chicken, cabbage, cilantro, and tomatoes in chicken-lime broth. For a sopa with slightly more kick, try the hearty tortilla soup made with guajillo peppers. Its creamy texture combined with crisp and salty tortilla chips will surely become a new winter favorite. Sister Soups are one of the newest additions to this West Village bakery’s lineup. Like the baked goods, soup flavors are unique and locally sourced, with past selections including a roasted carrot and sumac soup for lunch, topped with pistachios and mint yogurt, and thick carrot soup served with a cumin-cheddar pie cracker. Pair it with a Sister Salad or a hand pie for a filling, punchy meal you won’t find anywhere else. Sandwiches and soup are a match made in heaven at this Eastern Market Deli. The location features a wide variety of vegan and vegetarian soups like Italian vegetable, split pea, Cuban black bean, and more. 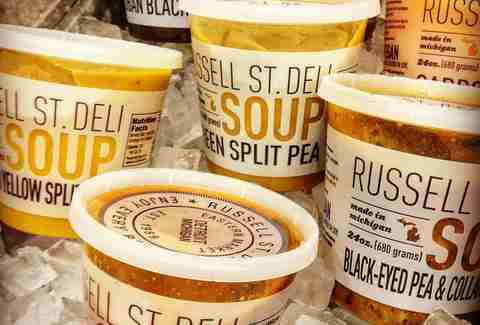 The deli is so confident in its soup-skills that it started hosting classes, the Russell Street Soup Academy, to teach others the ways of the bowl. No time to make a pot of your own? No problem. Outposts like Avalon Breads and the Midtown Whole Foods also sell the soups to-go. Vegetarian? Vegan? Gluten-free? This Downtown lunch destination features a dozen rotating soups of the day, including hearty choices for every palate. Selections are vast, ranging from options like Tex-Mex chicken and black beans and rice to vegan split pea. Regional classics like chicken lemon rice remain a consistent favorite. Pair any of the soups with a fresh sandwich or salad for a lunch you can feel good about. In the winter, the roasted curry lentil soup at this Midtown institution is a staple for students bracing cold treks across campus. The cafe features a variety of daily soup specials with interesting flavor combinations such as vegetarian roasted beet and apple bisque, and classics such as a good old-fashion tomato. Slurp while you sip on cocktails from the bar and admire the local art displayed in the space. You could try and guess the soup specialty at this Detroit eatery, but you're probably wrong. 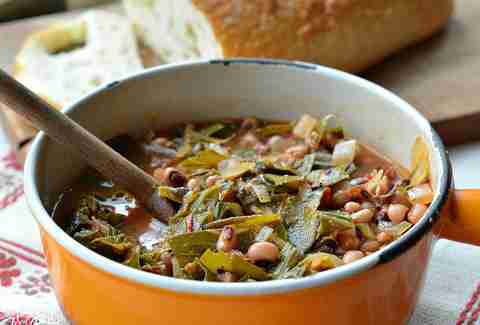 Move over, sweet potatoes -- the real star of the show during lunch is the black eye pea and collard green soup, served with warm sweet potato cornbread. With this quintessential comfort food, you’ll be challenged not to curl up for a nap after finishing a bowl. During the week, the location specializes solely in soups and sandwiches, with a shorter wait compared to the full weekend offerings. Stop in for lunch Tuesday-Friday. The soup menu at this Polish hole-in-the-wall is pretty straightforward: cabbage, chicken, pea, and Ukrainian are the only descriptions listed. What it lacks in descriptive words, Krakus more than makes up for in homestyle flavor. The Ukrainian, better described as a bright red beet borscht, is a classic favorite, served with simple white bread. Pair it with basic sandwiches or even some pierogis. With bowls priced at $1.95, you’ll be hard-pressed to spend over $10 at this cozy family spot. You can find Detroit-writer and breakfast enthusiast Lexi Trimpe eating her way through Detroit. Follow her on Instagram @thewestvillageidiot.